The model requires you first to state your name and the date. 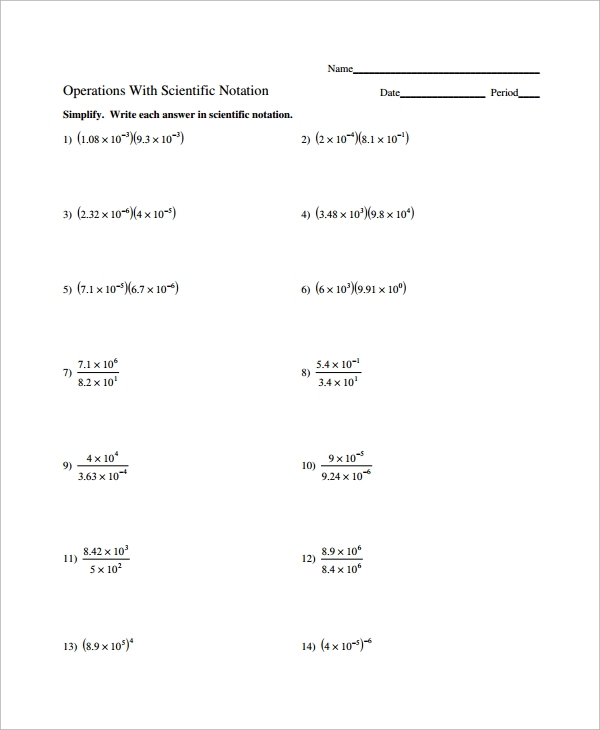 Then, you list the questions that have the numbers that you need to give using scientific notations. At the end of every question, you give your answer. Finally, your work should have subheadings for each category of queries you are required to tackle. 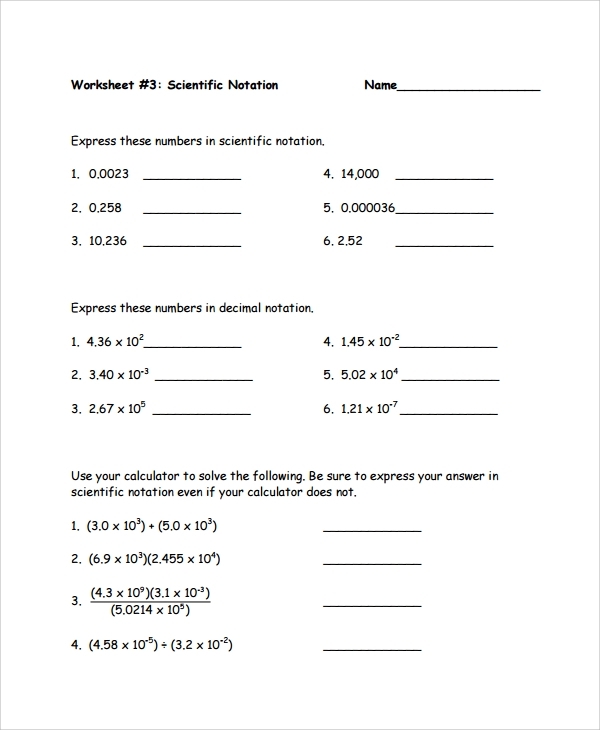 Like the scientific notation worksheet pdf templates, the model requires you to give your name. 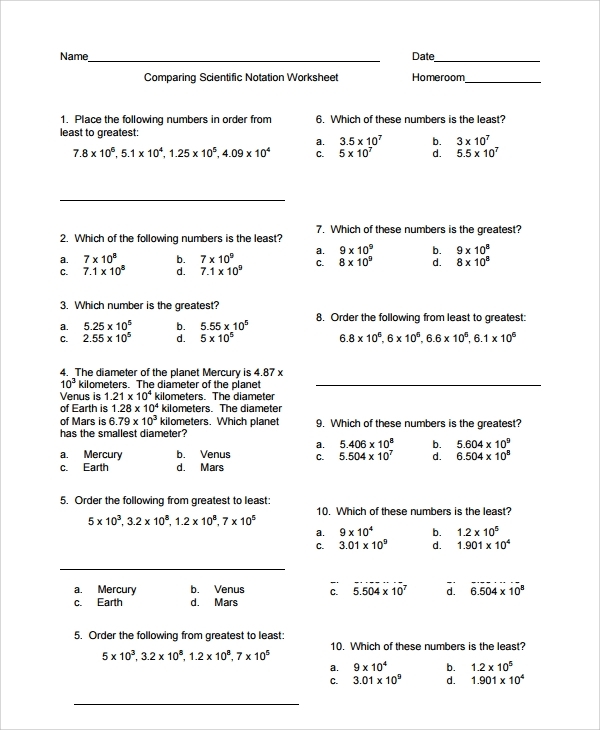 Also, label the number of the worksheet supposing there are other worksheets you have worked on, or you also have to tackle. Proceed with writing the instruction for specific questions then get down to handling them by writing the particular issue and its answer at the end. For all the issues that you will handle, ensure to list then under their instruction. 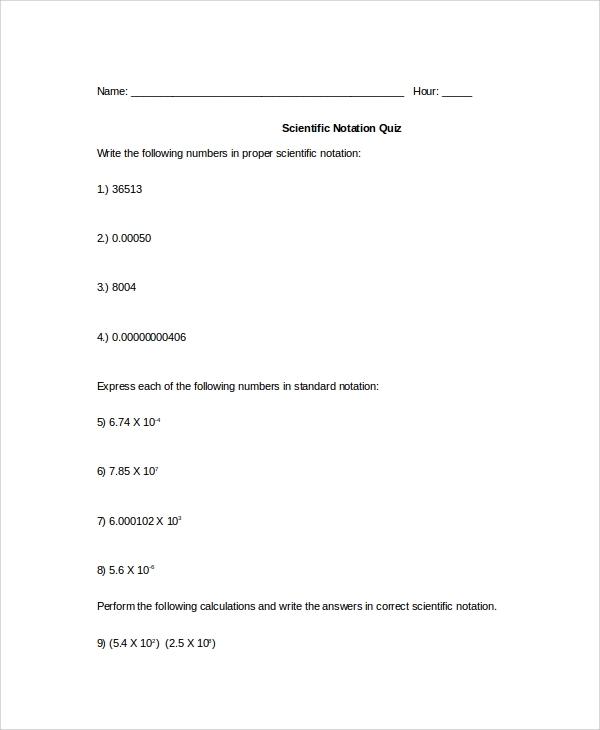 The model begins with stating the student’s name on the top left corner of the document and giving space on the right where the overall score gets written. 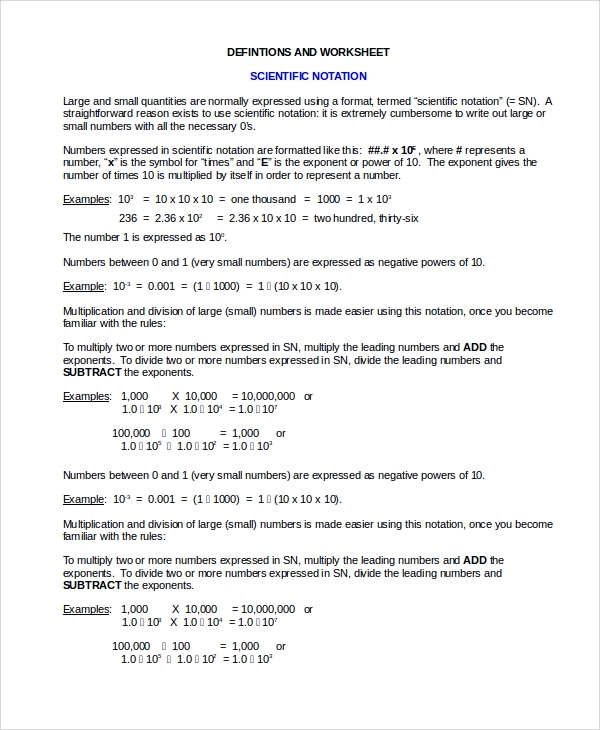 Next should be a heading indicating that the model is a multiplying numbers’ in scientific notation form. The questions getting handled should be put in two tables in two pages. The first table should start with the first issue worked out for it to be an example of how you will get to work out all the other queries. All workings for every question should appear on this table. Finally, the second one should just list the same issues and the final answers of each without displaying the workings. The left top of the paper should have the name of the one handling the job and under that, the name of the tutor. The right should have the date and under that, the period used to handle the questions. 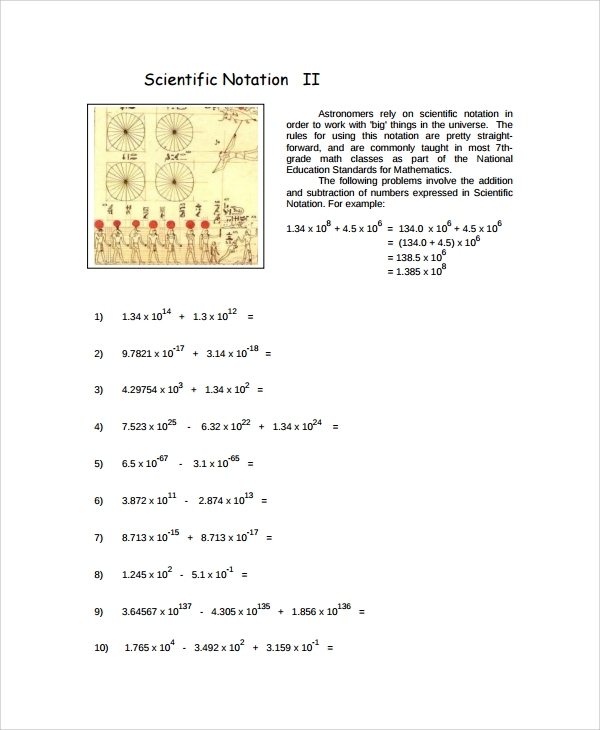 Following should be an indication that the form is a dividing scientific notation. The document has two sections. 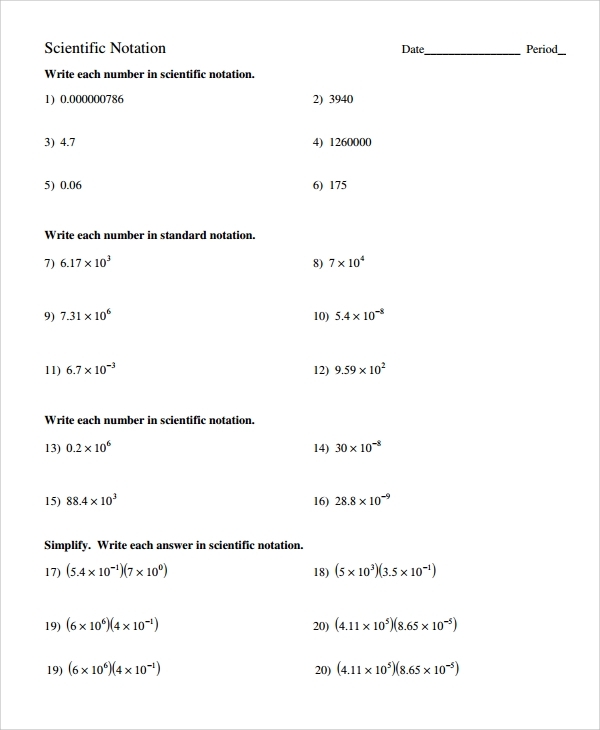 In the first one, you should lay out all the steps in the order of how you will work out all the questions. The second one should be a table with two columns where each box in the table will be for a question. 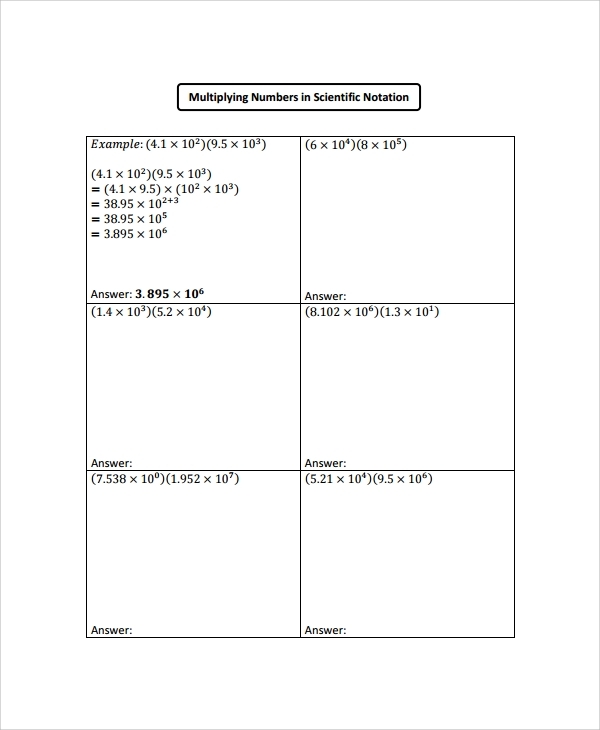 As seen before in the multiplying scientific worksheet template, the first issue on the table should act as an example of how you will handle the others. Finally, work out the rest of the items and indicate their answers still in those boxes. 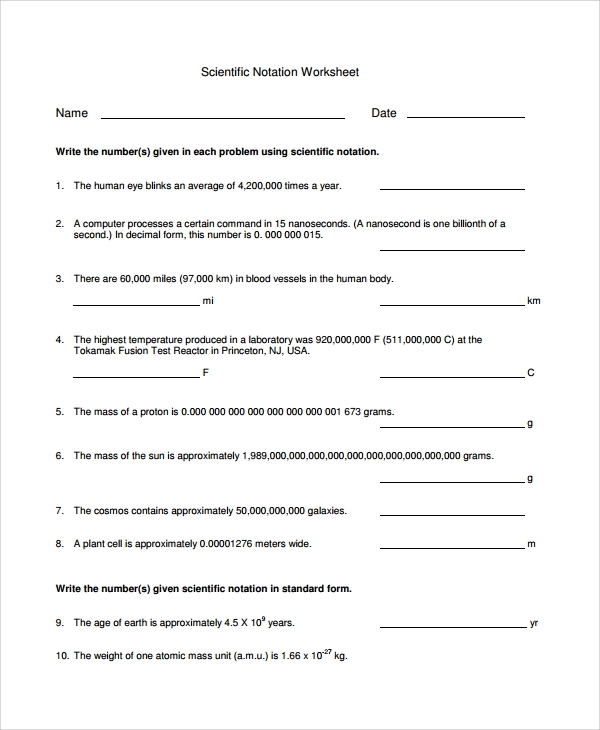 What are the Benefits of Having a Science Notation Worksheet Template? How Have We Made Our Templates the Best for You? Through our experts, we can design for you any custom template that you want. Our customer care representatives always stay intact ready to help you whenever you have any other inquiries.